Have you considered studying English in the USA, one of the most popular destinations in the world for international English students? It is home to a wide variety of fantastic language schools, but choosing where to study can be a difficult proposition. Each year QS rank the best cities in the world for students, and in 2017 it was Boston which was crowned the best student city in America. Learn more about Boston and other US cities below and apply to study English in the USA with SI-English today - we can guarantee you an offer letter from a school within 24 hours of your application being submitted! Boston has an international reputation for education which can rival anywhere else in the world, and in addition to universities such as Harvard and MIT, it can also boast a number of fantastic English schools. Boston is a great place to live as international student. Its rich arts scene offers something cultural for students to enjoy away from study, while if sports are your thing, the Celtics, Red Sox, Patriots and Bruins all have a fanatical support which is easy to get swept up in. New York is home to 8 million people and international students will feel right at home in the 'City That Never Sleeps' with its melting pot of cultures and ethnicities. 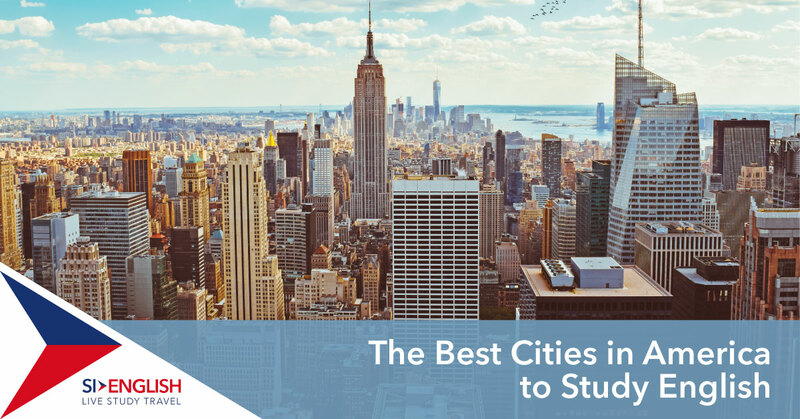 New York regularly ranks highly on the QS Desirability index – lots of students want to study here – and its English schools offer great learning facilities in the centre of the city. When looking for things to do in New York, close your eyes and think of all the music, film and history which has New York as its central character. San Francisco is home to thousands of international students who come to study at one of its many fantastic English schools or its world famous universities such as Stanford or Berkeley. Also home to the technology centre of the world, Silicon Valley, San Francisco is a progressive city which is constantly evolving to the needs of its people. Living in San Francisco may cost slightly more than the US average, but exploring this famous city and its landmarks make for a memorable experience. If you are interested in studying at a language school in the USA, get in touch with SI-English today. We can help you decide where to study and guarantee you an offer letter within 24 hours of your application being submitted!